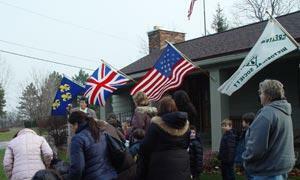 Orchard Lake Museum is the home of Greater West Bloomfield Historical Society. Items are available during Open Houses. Some items are available at the Orchard Lake City Hall, Oakland County Pioneer and Historical Society, Orchard Lake St. Mary’s Schools, Winterset Galleries, and West Bloomfield Town Hall. In 1854, a structure was built as the Orchard Lake House and later renamed the Orchard Lake Hotel. It was razed and replaced in 1938 with the current structure housing the Orchard Lake City Hall. In 1987, when a new city hall was constructed, the Greater West Bloomfield Historical Society was granted use of the building, now known as the Orchard Lake Museum.